Caja Laboral Vitoria made it to the Top 16 from Group C by thrashing Cedevita Zagreb 97-70 at Fernando Buesa Arena on Friday. Vitoria finished fourth in Group C with a 4-6 record after winning its last three games to clinch a Top 16 spot. Cedevita bows out of its maiden Euroleague season with a 2-8 record and in sixth place. 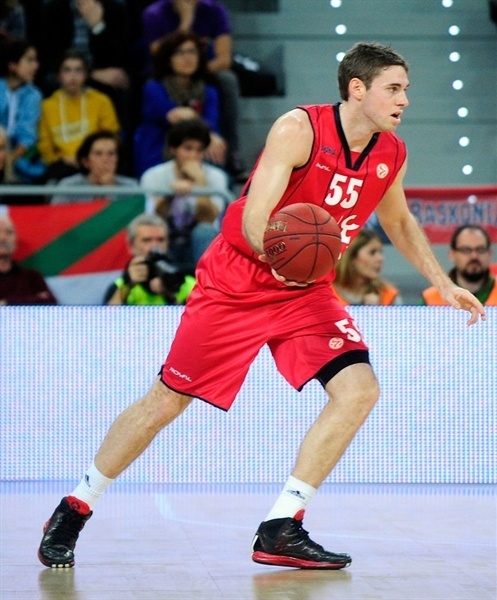 Fabien Causeur paced the winners with 23 points on 5-of-5 three-point shooting. 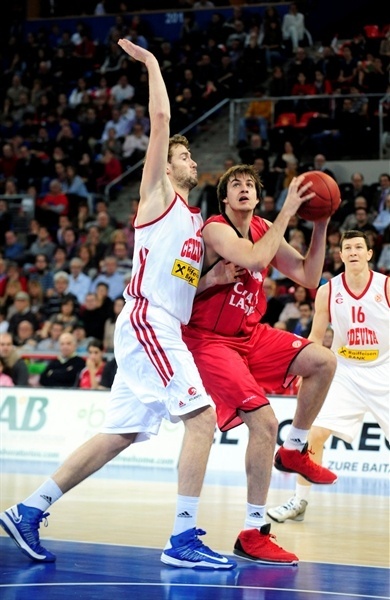 Nemanja Bjelica added 22 on 7-of-7 two-point shooting, Andres Nocioni scored 11 and Maciej Lampe 10 for Vitoria. 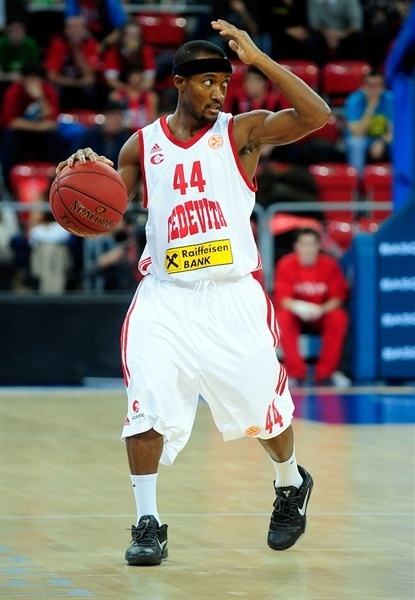 Goran Suton and Mickael Gelabale led Cedevita with 12 points apiece. Bracey Wright added 11 and Luksa Andric had 10 for the guests. 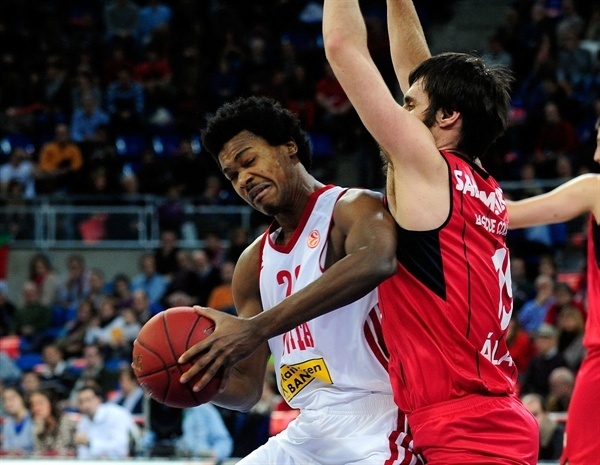 Wright and Gelabale shined early to give Cedevita a 15-19 margin early in the second quarter. It didn't last long, however, as Causeur buried four three-pointers in that period and got plenty of help from Nemanja Bjelica and Nocioni to break the game open, 49-30, at halftime. Nothing changed after that as the Vitoria fans had plenty of time to celebrate that their team will keep fighting for Euroleague glory. Lampe got Laboral going with a layup in transition, but Gelabale erased it with a fade-away jumper and banked in a close shot for a 2-4 Cedevita lead. Fernando San Emeterio shined with a coast-to-coast layup that Wright erased with a floating layup. Wright scored again, but a jumper by Lampe kept Vitoria within 6-8. Marques Green downed a stop-and-pop jumper and free throws by Gelabale made it a 6-point game, as the home fans started to wonder. Milko Bjelica nailed a corner triple off a timeout, as Vitoria improved its defense to avoid open shots in transition. 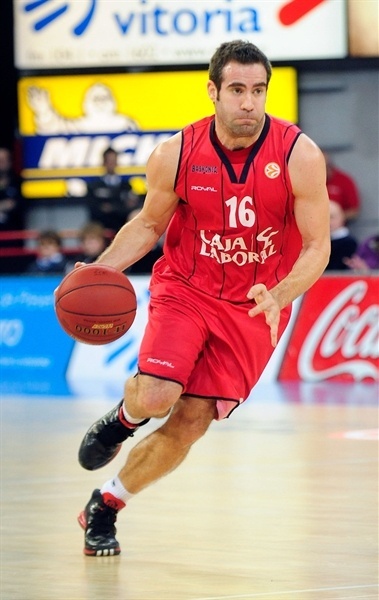 Lampe kept pacing the hosts with a turnaround jumper. Wright stepped up with a mid-range jumper. Lampe split foul shots and a corner three-pointer by Goran Suton boosted Cedevita's lead to 12-17. Thomas Heurtel answered from downtown to keep Vitoria within 15-17 after 10 minutes. Suton nailed a jump hook early in the second quarter but Causeur and Nocioni rescued the hosts with free throws to tie it at 19-19. Nemanja Bjelica ignited the crowd with a catch-and-shoot seven-meter bomb, but Suton quickly took over with a fast break slam. 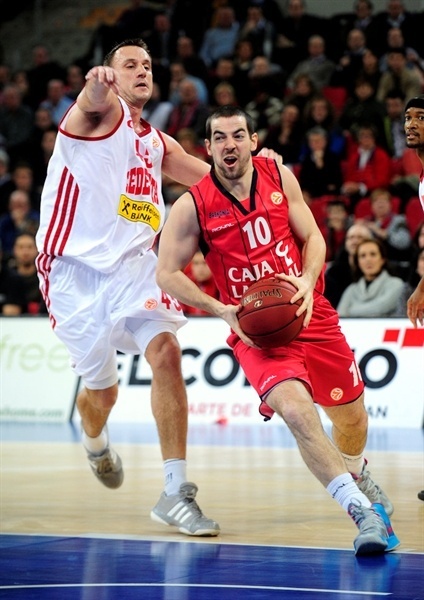 Causeur kept pacing Vitoria with a corner and Wright hit a jumper before heading to the bench with 3 fouls. Carlos Cabezas made free throws and followed Causeur's three-pointer with a fast break layup that gave Vitoria a 32-23 margin. Gelabale hit a jumper but Causeur sank his third triple and Nocioni made it an 11-point game, 36-25. Causeur struck again from downtown, Luksa Andric banked in a jump hook and a jumper by Nemanja Bjelica kept the hosts way ahead, 41-27. Marino Bazdaric scored around the basket, but Nemanja Bjelica split free throws and fed Nocioni for a fast break slam. Nocioni joined the three-point shootout and a driving layup by Nemanja Bejlica fixed the halftime score at 49-30. 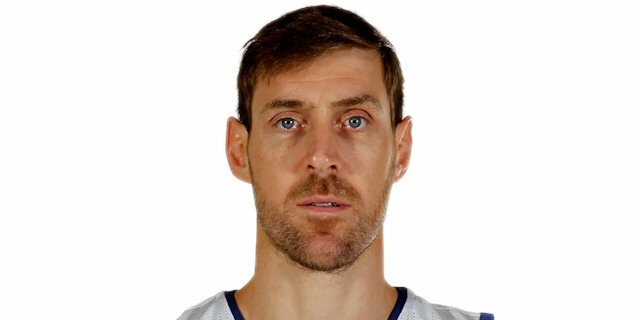 Third quarter: The Baskonia party starts! Miro Bilan scored around the basket right after the break and a jumper by Gelabale gave Cedevita some hope at 49-34. It didn't last long as Vitoria, pushed by an incredible crowd, adjusted its defense right away. Lampe struck from downtown and Milko Bjelica fed San Emeterio for a fast break layup to restore a 20-point lead. Green shined with a floating basket, but Milko Bjelica erased it with free throws. Wright and Milko Bjelica traded five-meter jumper and Bilan split free throws before Wright brought Cedevita within 58-40. Tibor Pleiss dunked and Causeur followed his fifth triple with a slam to boost the hosts' margin to 65-40. Gelabale, Bilan and Andric kept trying to change things for Cedevita, but back-to-back baskets by Nemanja Bjelica kept Vitoria way ahead, 69-47. Free throws by Andric fixed the score at 69-49 after 30 minutes. Nemanja Bjelica kept pacing Vitoria with consecutive layups early in the fourth quarter to seal the outcome, 73-49, with nine minutes left. 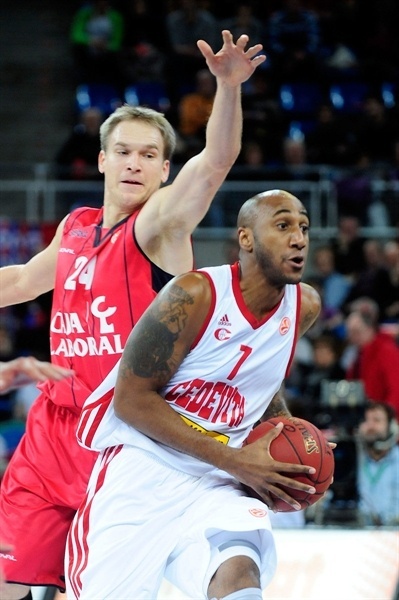 Cedevita kept fighting to finish its Euroleague season with a good fourth-quarter effort. Vlado Ilievski nailed a jumper, which Causeur erased with an acrobatic driving layup. Suton sank his second three-pointer and Andric dunked before Vitoria Coach Zan Tabak called timeout at 76-56. Ilievski and Green brought the guests a bit closer, 78-60, but a three-pointer by Nocioni and a layup by an unstoppable Causeur made it a 23-point game, 83-60. Cabezas buried one from way downtown and by the time Nemanja Bjelica dunked, everything was said and done. The Vitoria fans at Buesa Arena were celebrating that their team reached the Top 16 and Cedevita returned home with the goal to earn a spot for the 2013-14 Euroleague. "Many people asked to me if I thought we would be able to make it to the Top 16. I said I believed, and now I’m happy to say we made it. I won’t say it was easy, I don’t say we played great basketball all the time, but the team reacted pretty well. The players did a great effort, physically and emotionally, and we found great support from our fans, especially tonight. Tonight’s win was based on two factors. First, mental, because of the importance of this game. We managed to play intense. And second, more basketball related, was our approach. We are working to play fast, based on strong defense, with more possessions. We want to play like we did with our second unit tonight. We want to run more, to play better defense. We still have some habits I want to change. I won’t say they were bad habits, but they are not useful for the style I want for this team. We found inside ourselves the capability to persevere, to keep playing despite the struggle, to be able to win even though we are not playing our best basketball." "This game didn’t come at a good time for us. We are missing some players, and one of the best ones had to stay at home because of injury. We had a good start, played with intensity, but we went through a black three-minute period in which we lost everything. 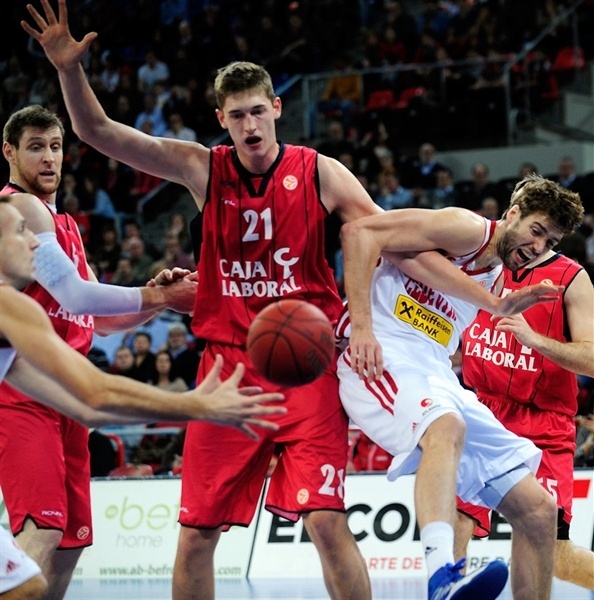 Caja Laboral found confidence and never looked back, so the game was decided too early. After that, it was no game, as I was thinking more of the next game we have to play in the Adriatic League because we need to solve many problems now. I congratulate Caja Laboral and Zan Tabak for this achievement, because I know it wasn’t an easy task for them. They made 15 three pointers, which is amazing. When your opponent is shooting with such a level of confidence, you are in big trouble, it’s very hard to play against." "We finally did it. We achieved our goal, it was very important for us to make it to the Top16. It has been a very tough regular season, but we managed to react and come back. It was not only a great achievement for the players, but also for the organization, the fans, everyone. We came out strong; we did the things we needed to win. Fabien [Causeur] played an awesome game, he shot the ball pretty well and helped the team build a solid margin that was definitive in the end."